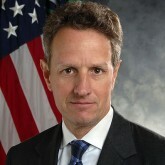 The former Secretary of the Treasury is a Dartmouth alumnus. Who had a hand in helping start his career? There’s an interesting article in “The Dartmouth” today entitled “Athletes benefit from career resources, alum. networks” written by Laura Weiss that we wanted to bring to the attention of our readers. In the piece, Weiss writes about how athletes — and, in particular, football players and men’s and women’s lacrosse players — often rely on former Big Green athletes to land jobs (especially in finance and consulting). As head Dartmouth football coach Buddy Teevens puts it, a strong academic and athletic record are qualities that employers seek in the job market. What do you think about the Wall Street ties between former Ivy League athletes and current Ivy League athletes? Is it interesting to you that many of these ties are on the football and lacrosse teams? Let us know your thoughts on the subject matter by posting a Comment below. We look forward to hearing from you.